PARSIPPANY, N.J., July 19, 2017 /PRNewswire/ -- Ortega, the brand of popular Mexican food products including taco shells, taco kits, Mexican seasonings and the number-one-selling taco sauce in the United States, spices up store shelves nationwide starting in June with the debut of two new must-try product lines: Ortega Good Grains Taco Shells, taco shells with unique, on-trend ingredients baked right into the shell, and Ortega Crispy Taco Toppers, crunchy toppings that add bold flavor to any dish. An alternative to the traditional corn shell, Ortega Good Grains Taco Shells are elevating the taco shell category, crafted with artisanal blends of real corn, unique grains and thoughtful ingredients baked into, and clearly visible within, each shell. Ortega Good Grains Taco Shells are made with whole kernel corn, giving them an authentic taste and a distinctive flavor, aroma and texture. Available in four different varieties—Blue Corn, White Corn with Chia Seeds, Yellow Corn & Ancient Grains and Whole Grain & Lentil—there's a flavor for every palate. Ortega Good Grains Taco Shells are available in packs of 10 for a suggested retail price of $1.99. For anyone looking to ramp up the flavor of their favorite dishes, Ortega Crispy Taco Toppers provide a bold kick with every bite. Available in Jalapeño and Onion varieties, they boast real jalapeño and onion slices lightly breaded and fried for a crunchy finish. The versatile toppers can be added to tacos, salads and burgers or enjoyed on their own as a zesty snack. The suggested retail price for a 3.5 oz. re-sealable pouch is $2.79. 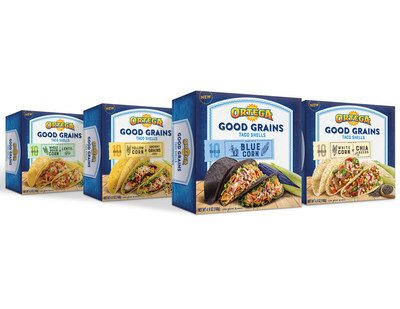 "The launch of Ortega Good Grains Taco Shells and Crispy Taco Toppers represents Ortega's commitment to creating innovative products that help bring families together around the dinner table," added Cockerham. For more information about Ortega products or Mexican meal inspiration, visit www.ortega.com, https://www.facebook.com/OrtegaTacos/, https://www.instagram.com/ortegataco/, and https://www.pinterest.com/ortegatacos/. B&G Foods, Inc. (NYSE: BGS) and its subsidiaries manufacture, sell and distribute a diversified portfolio of high-quality, branded shelf-stable and frozen foods across the United States, Canada and Puerto Rico. Based in Parsippany, New Jersey, B&G Foods' products are marketed under many recognized brands, including Ac'cent, B&G, B&M, Baker's Joy, Bear Creek Country Kitchens, Brer Rabbit, Canoleo, Cary's, Cream of Rice, Cream of Wheat, Devonsheer, Don Pepino, Durkee, Emeril's, Grandma's Molasses, Green Giant, JJ Flats, Joan of Arc, Las Palmas, Le Sueur, MacDonald's, Mama Mary's, Maple Grove Farms, Molly McButter, Mrs. Dash, New York Flatbreads, New York Style, Old London, Original Tings, Ortega, Pirate's Booty, Polaner, Red Devil, Regina, Sa-són, Sclafani, Smart Puffs, Spice Islands, Spring Tree, Sugar Twin, Tone's, Trappey's, TrueNorth, Underwood, Vermont Maid, Victoria, Weber and Wright's. B&G Foods also sells and distributes Static Guard, a household product brand. For more information, please visit www.bgfoods.com.